Never not knitting? You know who you are. 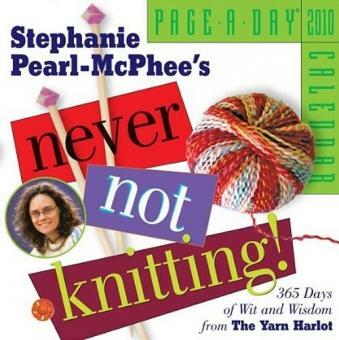 Stephanie Pearl-McPhee's Never Not Knitting! is the calendar for obsessive knitters, chock-full of advice, observations, ideas, and inspiration—all delivered with the author's signature humor and wit. How to control your urges in a yarn shop. Tuesday Tips, including taking care of your tools. Plus Purls of Wisdom, You Know You Knit Too Much When..., and: Knitting folklore says that if you knit a strand of hair into your work, you will be forever bound to the person who receives that work. In my life, this means that a lot of people are forever bound to my cat.